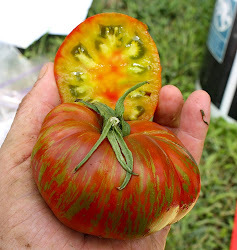 Tomato hybrids are F1 crosses between two stable inbred lines. Since tomatoes are primarily self-pollinated, O.P. (open-pollinated) varieties are stable inbred lines – with perhaps a little variability from low level chance outcrossing. 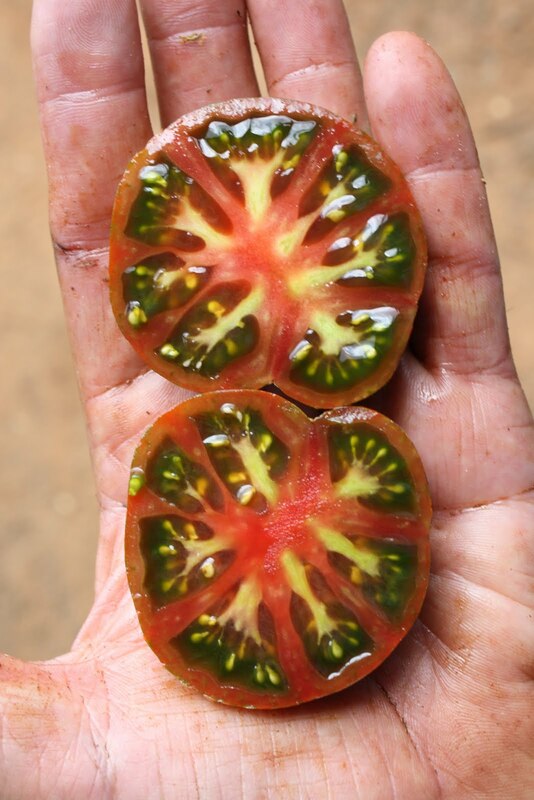 The vast majority of all of the commercial tomato production in the world is with F1 hybrids, whether the hybrids are designed for processing or fresh market use. Higher fruit yield in F1 hybrids is probably the biggest driver here, but stacking disease resistance genes is another benefit. Since most commercial breeding companies are breeding for traits other than flavor – most F1 hybrids, with a few outstanding exceptions, are lousy in that regard. 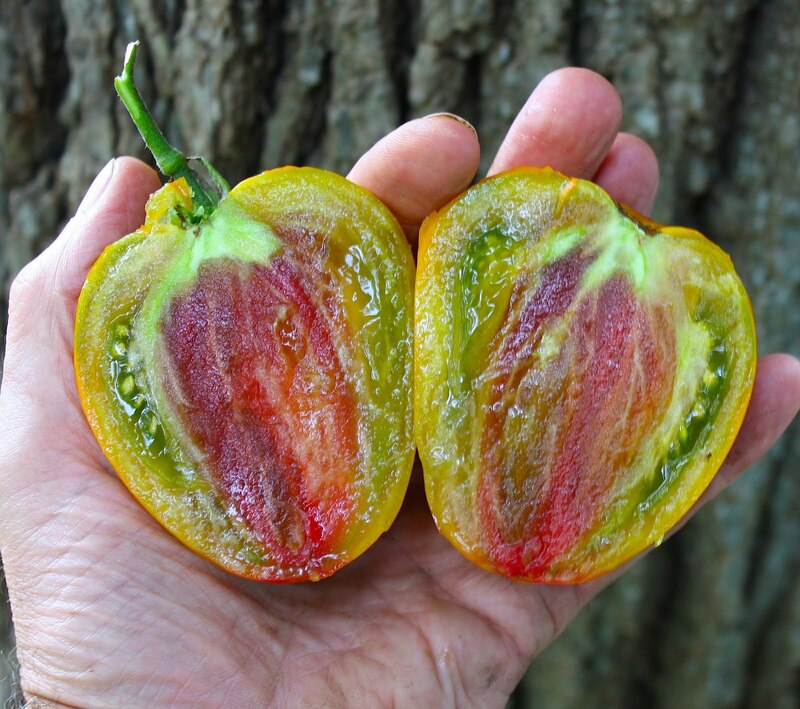 Heirloom types, developed over many generations by families and/or communities, have been selected primarily for flavor. These are all O.P. 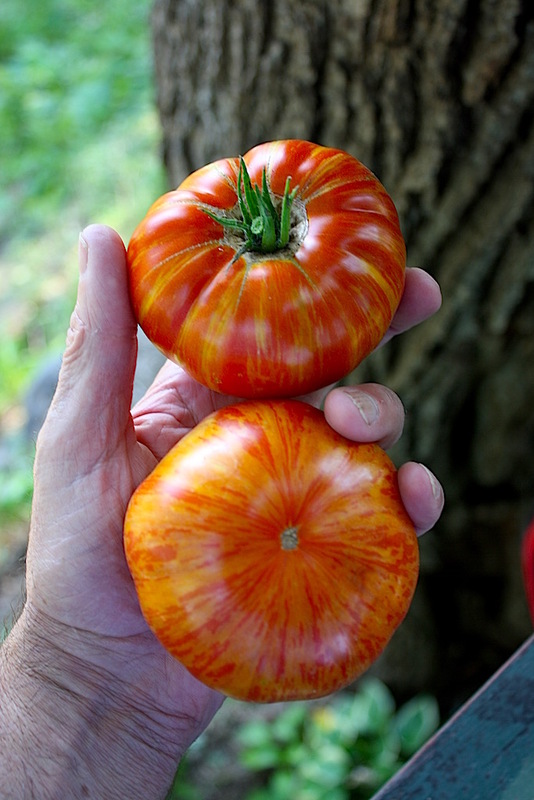 types, though I know there are some companies talking about heirloom hybrids - heirloom x heirloom I suppose. 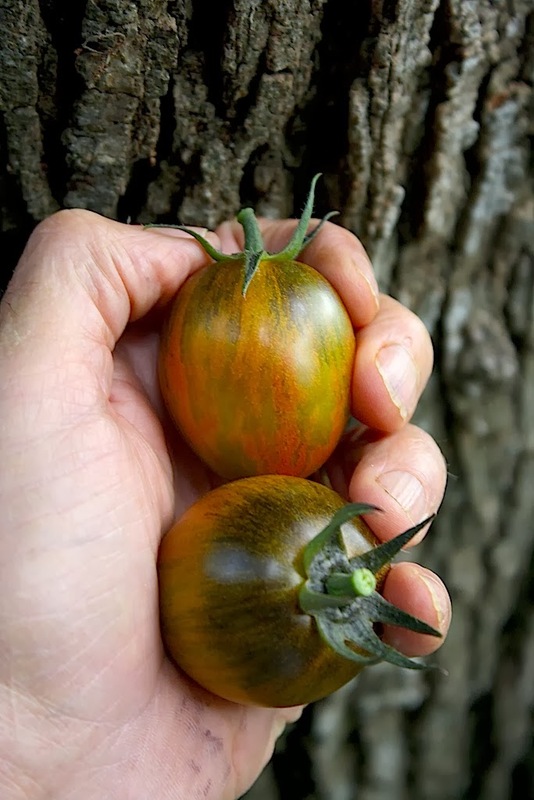 Heirloom varieties typically have their own set of challenges: low yield, disease susceptibility, short shelf life, and/or fruit quality (cracking/catfacing, etc.) problems. 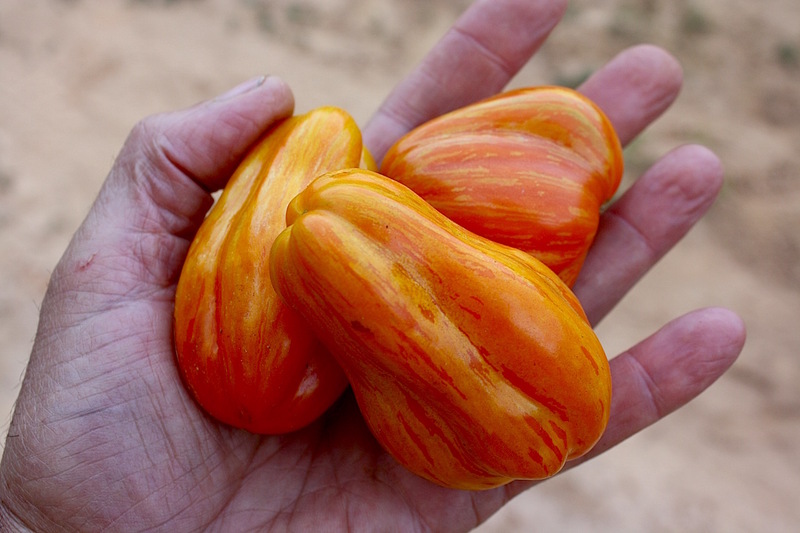 In the last several years several breeders have begun crossing commercial hybrids with heirloom types to get the best of both worlds – but that’s a different story. 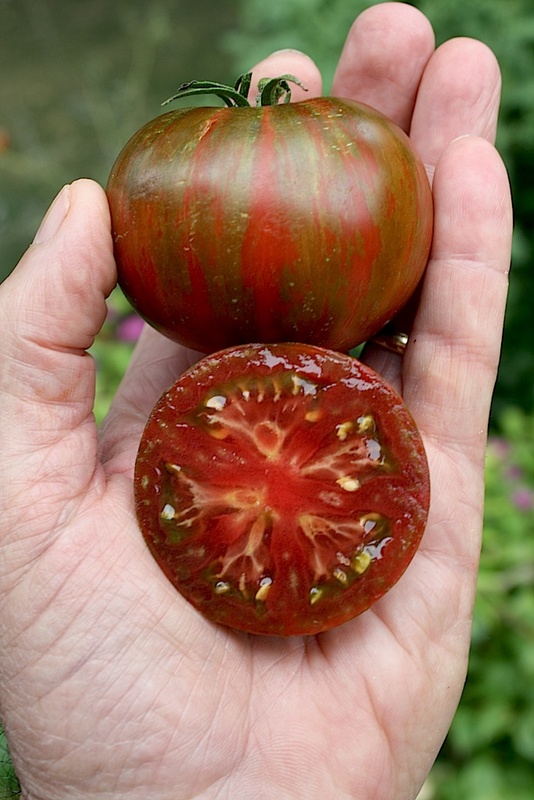 As a tomato breeder I see intrinsic advantages in F1 hybrids – some obvious, others not. traits (reference; pages 115-127), including sugar and acid content - key drivers for flavor (reference). We make several dozen new F1 crosses every year and in many cases we see exceptional flavor in the F1 generation that we never successfully stabilize in succeeding filial generations. Several years ago my friend Bill Jeffers sent me seed of a F1 cross he made (Indian Stripe x Sungold). Flavor in the F1 generation was out of this world, and to our mutual disappointment we were never able to capture anything close to this in F5/F6 lines. Another breeder friend Keith Mueller has commercialized the F1 hybrid “Purple Haze” derived from a cross between Black Cherry and a (Brandywine x Cherokee Purple) line he developed. He says that this specific combination demonstrates heterosis for flavor that stands out from other similar crosses he tested. In 2016 we tested ~60 hybrids and the corresponding parent lines in both open field and greenhouse trials in Wisconsin. There was clear heterosis for both fruit yield and flavor - and a handful of parent lines with great general and specific combining ability for flavor, as judged by our 3-4 person tasting team. Stacking disease resistance traits. Wild relatives of tomatoes have been a rich source of genes for resistance/tolerance to key tomato diseases. With few exceptions these disease resistant genes are inherited as dominant alleles – e.g. Resistant x Susceptible = Resistant. In a F1 hybrid typically one parent will be resistant to one set of diseases (e.g. ABC), the other resistant to another set of diseases (e.g. DEF) with the hybrid then resistant to both sets of diseases (e.g. ABCDEF). This has proven to be a very effective way of stacking disease resistance generally in tomato varieties, and an absolute requirement when trying to combine traits that are linked in repulsion phase, e.g. resistance to late blight and tomato spotted wilt virus. Some genes are desired in the heterozygous state. In inbred (i.e. O.P.) lines the plants are homozygous at virtually all loci. For a particular gene/locus the heterozygous condition is only possible in a hybrid, or an unstable segregating population. The recessive rin allele is involved in fruit ripening. In the homozygous state the fruit never ripens, in the heterozygous state (rin/+) there is delayed ripening of the fruit, providing extended shelf life (reference). Many of the vine ripened tomatoes (cherry, grape and cluster) now being marketed in grocery stores are rin/+ F1 hybrids. 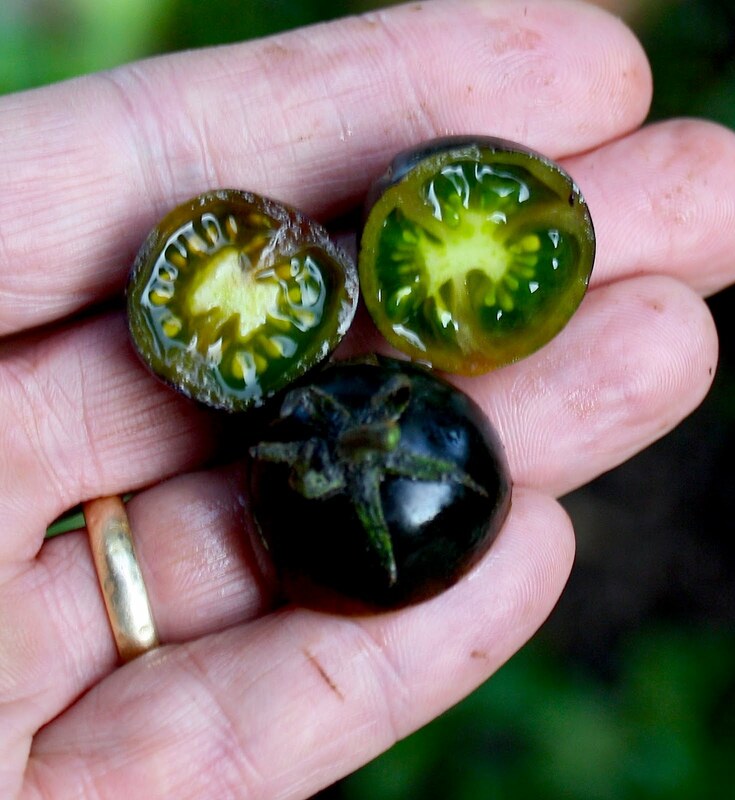 The NC State rin/+ hybrid Mountain Magic is an excellent example of a tasty tomato with exceptional shelf life (and state of the art multiple disease resistance). More recently a discovery was reported that a loss of function mutant allele in the gene SFT, which codes for the flowering hormone florigen, had a profound effect on plant growth in tomatoes. 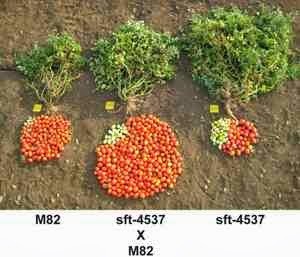 Homozygous sft/sft plants had significantly delayed flowering and low yield, heterozygous plants sft/+ (in determinate plants) had 60% higher yield (photo above) and enhanced flavor (reference). Complementary traits. Some of our best inbred lines absolutely nail some traits (e.g. flavor and/or fruit type), but have one or more key weaknesses (e.g. splitting, poor seed yield, late fruiting or plant architecture). By selecting hybrid parents that compliment each other for key traits, we’ve identified F1 hybrids that are clearly superior to the parents. This is perhaps another ramification of the heterosis discussion above. There are only two disadvantages of hybrids vs O.P. varieties that I can think of: a) seed production is more complicated, more expensive and grower saved seed is not an option; and b) a significant portion of the customer base for tasty locally grown (homegrown or farmers markets) fresh market tomatoes has an anti–hybrid bias, unfortunately often confounding F1 hybrids with GMO traits, organic vs conventional, or big biz vs family owned operations. 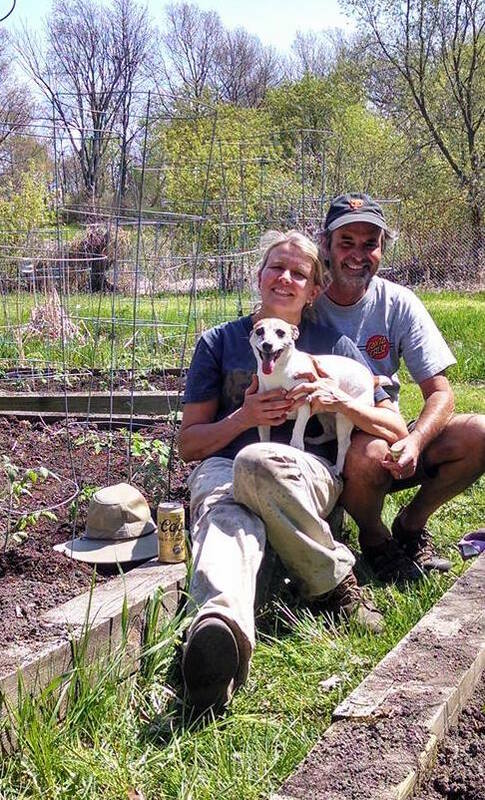 Frogsleap Farm is a two person husband and wife breeding team, working with the best heirloom and commercial hybrid germplasm we can find, and developing novel varieties (including F1 hybrids) for both organic and conventional producers. We think both F1 hybrids and O.P. varieties will have a place in an exciting marketplace of unique and tasty tomato varieties adapted for use by home gardeners and small to medium sized tomato producers. The first picture is so cool! Tomatoes out of tomatoes:) I remember doing such pictures about books at book review of http://essaytoday.net/ I like this stuff. Wish you to be prosperous with your farm. I am really enjoying your blog! A lot over my head for sure, but very interesting and I'm finding that I should consider more hybrids. Could you suggest a few good recommendations for greenhouse growing? Do you sell seed from your breeding? Any parthenocarpic versions for the south? Something to help with our very hot summers. Thanks so much.